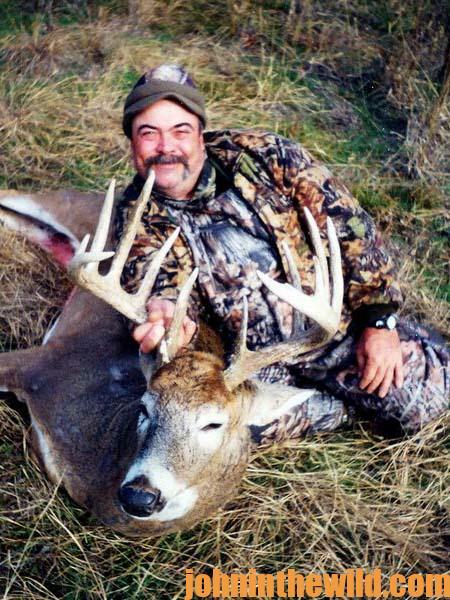 John’s Note: Ernie Calandrelli of Orchard Park, New York has been shooting PSE bows www.psearchery.com for 30-plus years, is a member of the Mossy Oak Pro Staff www.mossyoak.com and Director of Publications and Advertising for Quaker Boy Calls www.quakerboy.com. 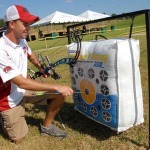 In 2014, he’s shooting the PSE DNA because he likes the speed the bow delivers, the forgiveness of this bow and the ease with which he can draw it. 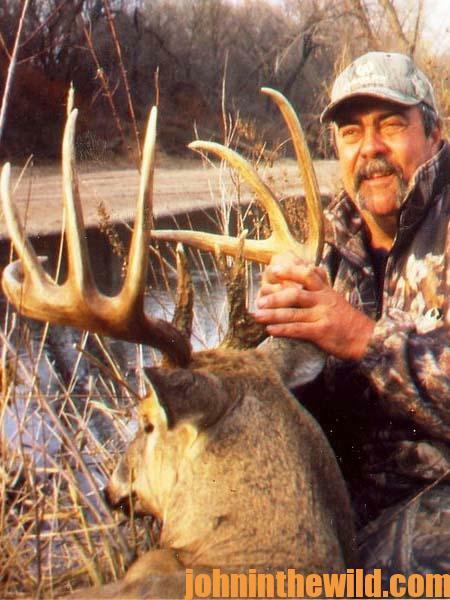 I once found a buck lying down in a CRP field that had a 160-inch rack. I stalked within 17 steps of this buck. I never knew until after I shot that the buck was laying down next to a doe that I’m sure was in estrus. The buck was looking at me, and I couldn’t see his entire body. I followed the line of his neck down to where I could see the top of his shoulder, aimed just a little behind what I thought was his shoulder blade and released the arrow. When the buck took the arrow, he jumped straight up and so did the doe he was bedding. The shot was so difficult for me because I couldn’t see the buck’s entire body, and he’d been staring at me during the whole stalk. When I drew the bow, and once I released the arrow, he jumped straight up and ran 32 steps before he piled up. Another question I’m often asked is, “What’s the longest shot you’ve ever made?” My answer is 30 or 35 yards. Ninety-five percent of the bucks I’ve taken, I’ve shot within 20 yards or less of my stand. Most of those deer were taken from tree stands, however in the last few years, I’ve started taking a ground blind with me too. Then I even can hunt in bad weather, as I’ve explained earlier (see Day 4). I remember one time I was hunting in Kansas in a woodlot we called the Archery Woods, because this woodlot was once an archery 3D range. To get to the stand, I had to walk across about a 400-yard soybean field. On that morning when I could see the bad weather coming in, I put on my rain suit, walked across the bean field and got in my ground blind where I could stay dry and be somewhat comfortable. I hadn’t been in my ground blind more than 5 minutes when I’d spotted nine different bucks chasing the same estrous doe. Finally, one buck that would score 135 to 140 points, stopped 20-yards from my blind, and that’s when I drew and shot him. 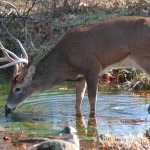 During the rut, I don’t believe the weather has that much effect on deer movement. The bucks know they only have a few days to find and breed the does, and they won’t let the weather stop them from looking for does. 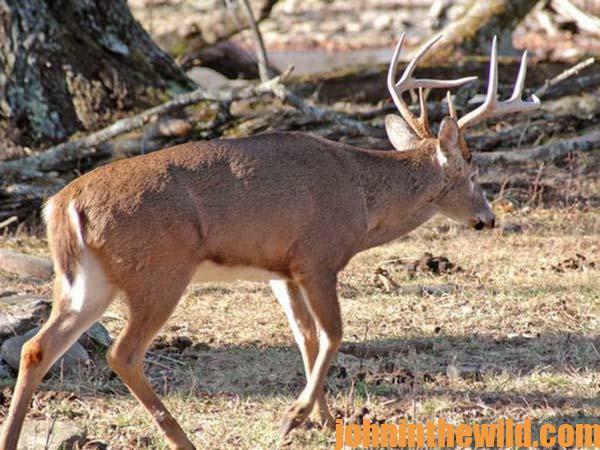 Another question I’m often asked in seminars is, “When do you use rattling antlers to call in a buck?” I believe there are 5 to 7 days when rattling antlers is the most effective – right before the peak of the rut. 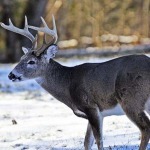 At that time, rattling antlers often can work like magic to call in mature bucks. I’ve found over the years that the second week of November tends to be the time in my area that I’ve had the best luck calling in bucks with rattling antlers. 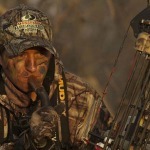 But I still use grunt calls and snort-wheeze calls in conjunction with rattling antlers. Another time that I use rattling antlers during deer season is when I can see a buck off in the distance and can’t get that buck’s attention by grunting to him or giving him a snort-wheeze call. That’s when I’ll use whatever I have to use to try and capture that buck’s attention, whether it’s a loud grunt call or crashing antlers together as hard as I can hit them. When I have people tell me, “I tried to grunt in a buck,” or, “I tried to rattle in a buck, and the buck never came in,” and ask, “Why do you think that buck didn’t come in?” my answer is that 98 percent of the time the buck probably didn’t hear the call. That’s why I think hunters always should carry rattling antlers, and loud snort-wheeze calls. I always carry the Quaker Boy Deer Thugs Brawler and Weezzy with me. Then I can grunt softly or loudly, growl and/or give a snort-wheeze call. Every buck that I’ve taken that scored 160 Pope & Young or more, I’ve called in with a deer call. I remember one buck that was 200-yards away standing on the side of a hill above a CRP field with the sun hitting him just right to make him appear to be glowing. 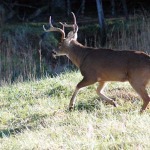 When I grunted to the buck, he whipped his head around and looked straight in my direction. 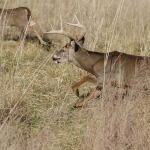 Once I grunted a second time, he came right down across that CRP field like a ball of fire. His hair was standing up all over his body, as he stopped on the edge of some small trees about 80-yards from me. He started ripping up those small trees with his antlers. I grunted to the buck again, and he ran to within 12 yards of me and stopped. I shot him with my PSE bow. The biggest buck I’ve ever taken with my bow scored 176-1/2. I only had been in the stand for 25 minutes before I spotted this buck. When I first got to the stand, I ranged a rub that was 17-yards from my stand. Not much had been happening, so I grunted, and this buck stood-up out of a thicket on the edge of a creek bank, on the same side as my stand. This deer went down over the creek bank and out of sight and then appeared on top of the bank, 12-yards from my tree stand. I think the buck saw me or smelled me just as I drew the bow. He turned and ran back toward the thicket from where he’d come. When he got to that rub I’d ranged at 17 yards, he stopped and looked back. I was already at full draw, so I turned the arrow loose. He only went a few yards before he went down. I never go in the woods without several deer calls.